Chef Michael Adams and his team have put together a special menu for the benefit of the Hitchcock Center, featuring seasonally sourced, vegetarian and non-vegetarian selections from our local farms. A portion of the proceeds from this delicious three-course prix fixe menu will benefit the Hitchcock Center. 30Boltwood shares with the Hitchcock Center a deep commitment to the environment and remains dedicated to sourcing from local purveyors and supporting local farmers. This special menu affords us the opportunity to showcase the abundance of seasonal produce and proteins available to us in the Pioneer Valley. 30Boltwood’s environmental commitment extends beyond the plate and into the physical plant. As a LEED Silver certified a building, the Inn on Boltwood is one of the greenest in the Pioneer Valley, has also earned the 2014 Sustainability Champion Award from Historic Hotels of America. Using a geothermal ground source heating and cooling system, water-efficient landscaping, energy efficient plumbing and electrical fixtures, regionally manufactured and recycled content materials and CO2 fresh air activated systems in all of their meeting rooms, the Inn shares many of the sustainability measures implemented in the new Hitchcock Center. 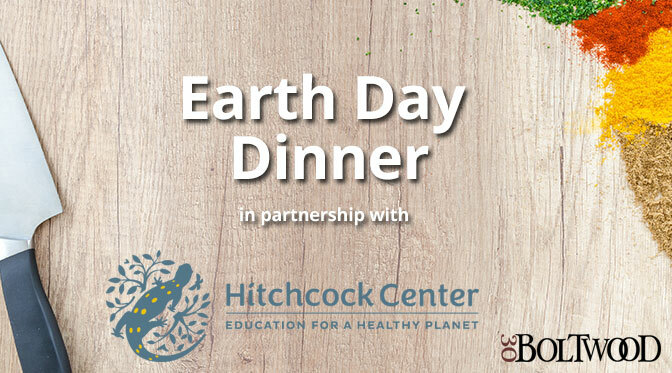 We are excited to partner with the Hitchcock Center to pair our contemporary, locally sourced farm-to-table menu with Hitchcock Center’s world-class environmental education center and programming that serves over 13,000 children, youths and adults each year. Please join us for a delicious full-service dining experience and help support environmental education for people of all ages and abilities! Reservations are strongly encouraged and can be made by calling (413) 835-2011. The Hitchcock Center is an award-winning nonprofit organization that works to inspire people to learn about our natural world through innovative, hands-on environmental education programs. The Hitchcock Center’s education for a healthy planet helps people to explore the interconnections between the health of humans and ecosystems, reinforcing our innate bonds with our environment, and looking to nature as a model and measure to improve our quality of life. Now operating from a new net-zero energy and net-zero water facility, the Hitchcock Center aims to be the first environmental learning center in New England to achieve full certification under the Living Building Challenge, the world’s highest standard in sustainable design. Free building tours are offered twice a month, and the Visitor Center is free and open to the public from Tuesday – Thursday, 9a to 5:30p, on Fridays from 9a – 5p, and on the second Saturdays of the month from 9a – 1p for a free seasonal Saturday Family Science program. More information and the full schedule of year-round program offerings can be found online at hitchcockcenter.org.